Raoul du Toit coordinated conservation initiatives that have helped develop and maintain the largest remaining black rhino populations in Zimbabwe. Faced with shrinking habitats and the ever-looming threat of poaching, Africa’s black rhinos remain critically endangered. The promise of catching a glimpse of these iconic animals draws international tourists to private game parks, bringing much-needed income to several countries in southern Africa. But in Zimbabwe, tourism withered during a decade of political strife, and a small group of conservationists were left to work against all odds to protect the country’s remaining rhinos. Currently home to the fourth-largest rhino population, Zimbabwe has demonstrated a series of successes and failures in its conservation efforts. Following devastating poaching in the late 1980s, a strategic consolidation of conservation efforts succeeded in increasing Zimbabwe’s black rhino population during the 1990s. Rhinos were moved to areas in southern Zimbabwe as the flagship species for the conversion of cattle ranches into wildlife conservancies. Breeding projects were established and with the burden of rhino protection placed mainly on the private sector, rhinos showed exceptional population growth. However, in 2000 the private sector strength of this initiative became its weakness as the government of Robert Mugabe turned ranching operations in Zimbabwe upside down. With the initiation of a radical land policy permitting the expansion of subsistence farming into the conservancies, some of the successful conservation projects collapsed while others proposed new shareholding arrangements, which are still not resolved. The subsequent reduction in law enforcement in the conservation areas coincided with a sharp increase in the number of rhinos slaughtered by poachers supplying the illegal trade in horn, which is a rare and prized commodity fetching high prices in Asia. Although discounted in western medicine, the alleged medicinal value of rhino horns has been culturally established in Asia over many centuries. The increasing presence of East Asians in Africa has shortened the supply chain, allowing high market prices to be paid closer to the source of the horns. Zimbabwean-born Raoul du Toit grew up with a strong conservation ethic, spending much of his free time in nature. He began his career studying the environmental impacts of hydro-power projects in southern Africa, but was then recruited into an international organization that coordinated rhino and elephant conservation work throughout the continent. From this position, du Toit saw how healthy populations of these species enhance biodiversity and wildlife-based development in Africa’s semi-arid regions. He set out to promote innovative models for rhino conservation linked to rural development in his native Zimbabwe. As a central figure in the development of the conservancies in Zimbabwe during the 1990s, du Toit was one of the few professionals left to keep these rhino breeding projects viable during the turbulent 2000s. With shortages of basic commodities and the catastrophic devaluation of the Zimbabwean currency, many professionals left the country. Funding for conservation projects evaporated. Prioritizing the interests of the rhino species before political considerations, and convinced that a professional team could still promote these interests despite the adverse conditions in Zimbabwe, du Toit and his team met the challenges head-on. Today, the black rhino population in the Lowveld region has stabilized thanks to the efforts that du Toit has coordinated. Despite the turmoil that has threatened rhino populations in the southern part of Zimbabwe since 2000, there are now 350 black rhinos in the region. The majority of these rhinos live in lands associated with the Lowveld Rhino Trust, which was established by du Toit in 2009 with support from the International Rhino Foundation and other donors to secure large swaths of protected habitat. These areas are now home to about 80% of Zimbabwe’s total rhino population and contain both private game parks and publicly protected lands. Today, du Toit and his small team work in and around the large Lowveld reserves to monitor rhinos, address injuries, reinforce efforts to tackle poaching, and build community awareness of the need to conserve rhinos. He also advocates on the international level for rhino protection and has helped reintroduce rhino populations in Botswana and Zambia. Du Toit’s program does not simply focus on wildlife conservation. Instead, he incorporates international policy, biodiversity in the larger context, and land use to make sure Zimbabwe is constantly negotiating the balance between conservation and development. For du Toit, environmental stewardship and wildlife conservation are crucial aspects of Zimbabwe’s path to development. 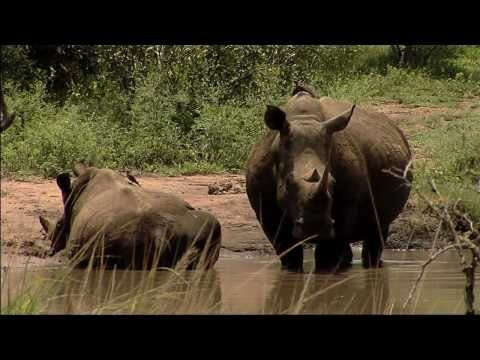 To create economic incentives for local communities to conserve rhinos, the Lowveld Trust is assisting these communities to acquire rhino breeding stock in adjacent conservancies, so that the valuable progeny can be sold to restocking projects in the region and the proceeds used to fund local schools. For du Toit, the birth of every rhino is a heart-warming achievement in the struggle to save this species and the ecosystems it inhabits, especially if that birth represents some tangible gain for impoverished people upon whose attitudes the future of Africa’s wildlife and wild places depends. 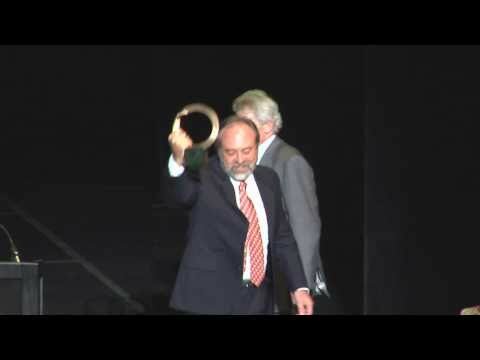 Raoul du Toit, receiving his award at the 2011 Goldman Prize ceremony. Raoul du Toit, accepting his award at the 2011 Goldman Prize ceremony. Raoul du Toit, 2011 Goldman Prize winner for Zimbabwe.